How to select and order your banner. Choose a design option for the style of your banner. Do you wish it to be a simple, single colour promotion or a more visually appealing 2/3 colour or full colour printed display? Are there simple logos to be included or is it just text? When you have chosen the style content from our A,B,C,D and E options below, then next select a stock size of height and length that will best suit the project. We offer sizes from 22"/56cm high up to 10ft/305cm in length. We have shown as a guide how an average coverage of lettering will look on each of these stock sizes. Next pick from our drop down menus the banner colour and the text colour/s that you want for your design and we will create the artwork based on your selections. If your design option allows for a logo or photo, then select YES or NO for these also. We will create your banner with a couple of different letterstyles and these can be altered later if you have a specific font that is required. Once payment has been made you can return link back to us from PayPal and then follow on to our send us the details area, where a contact form can be filled in and any relevant letterstyle (tty for PC) or logo / photo files can be attached and sent. We offer a discount on all orders of 5 banners or more. Please contact us by email or phone if your order quantity will qualify. White banner with one colour text only. Colour banner with one colour text only. White or colour banner with 2 or 3 colour text. White or colour banner with 2 or 3 colour text and a logo (supplied by customer). We offer the same selection of "stock sizes" for these full colour printed banners (22", 34" & 46" heights x varied lengths), however they can also be made at any height up to 5ft / 153cm high and by any length up to 20ft /610cm. Full colour printed banners with photo quality artwork. STOCK SIZES AND BESPOKE SIZES ARE AVAILABLE FOR OUR PRINTED BANNERS. 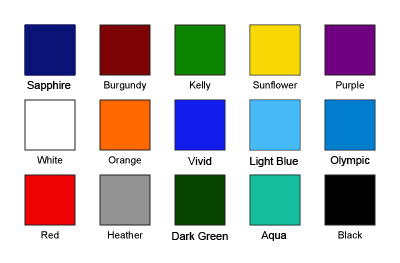 Vinyl colours available for the stock banners. Then select your banners below, Add to Cart and proceed to the checkout. Once payment has been made please send us the details of the content that you require and we will email back with a proof for your approval. fitted with one colour text only. Select LENGTH of banner needed. Select a COLOUR for the text. You can write in your own choice of text colour if not shown in the drop-down menu. A maximum 10 lines of text is allowed. Select quantity of each banner at the checkout. White 22" high banner with design option A. White 34" high banner with design option A. White 46" high banner with design option A. Design option B fitted with one colour text only. Colour 22" high banner with design option B.
Colour 34" high banner with design option B.
Colour 46" high banner with design option B.
fitted with 2 or 3 text colours. Select MAIN & 2nd COLOURS for the text. You can write in your own choice of text colours if not shown in the drop-down menus. White / Colour 22" high banner with design option C.
White / Colour 34" high banner with design option C.
White / Colour 46" high banner with design option C.
Design option D fitted with 2 or 3 text colours & logo. **You can write in your own choice of text colours if not shown in the drop-down menus. White / Colour 22" high banner with design option D.
White / Colour 34" high banner with design option D.
White / Colour 46" high banner with design option D.
any artwork / photo quality printing. If NO, we will add some clipart or appropriate image into the design for you. If YES, attach a copy when you send us the details. all artwork is supplied ready to print. Full colour 22" high banner with design option E.
Full colour 34" high banner with design option E.
Full colour 46" high banner with design option E.